The familiar clove buds are the dried, aromatic flowers of the tree. They are picked before the blossoms open and dried for 48 hours in the sun, becoming brown in the process. The clove is a tropical evergreen tree of the myrtle (Myrtaceae) family. The tree can grow to be 90 years old and may yield 800lbs to 1,000lbs of cloves per year. The name 'clove' comes from the Latin word 'clavus,' meaning nail, as the buds were thought to look like them. According to legend, there was only one tree in the world that bore cloves, found in the middle of the Island of Mafia. All the other trees had to bow down to it to pay homage. Clove trees are believed to have originated in Indonesia and Moluccas, then known as the Spice Islands. They were traded from there to China as early as 100-200 BC. They were cultivated by the Dutch and smuggled to the West Indies and Mauritius by pirates of various nationalities. There was a centuries-old struggle for a monopoly on cloves, which is a very valuable spice. It takes 5-7,000 dried cloves to make a pound of spice. Cloves are used in foods, pot pourri and pomanders. The main producers today include Madagascar, Tanzania and Indonesia. A major proportion of the world's clove production goes to Indonesia for use in a particular type of cigarette. 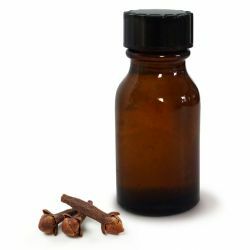 Clove is a spicy, warming and stimulating herb and can boost circulation. It has an anaesthetic and analgesic effect. It is also anti-fungal and antiseptic, which makes it useful in products for the feet. Cloves are used in herbal medicine, including medicine in China. They were first mentioned in Chinese medicine in about AD600. Clove is known in Europe particularly for its soothing effect on toothache. The ancient Chinese used to hold a clove in the mouth to perfume the breath when speaking to the emperor.